Here's something fun while we're on the subject of Wreck-It Ralph. The filmmakers had an obvious love for 80's arcade culture and incorporated all sorts of fun references into the different game worlds. Similarities between Fix It Felix Jr. and Donkey Kong are especially evident(a working man hero climbs a tall structure to defeat a big oaf), Turbo Time was heavily influenced by Namco's Rally X, Sugar Rush is reminiscent of Mario Kart, etc. However, I noticed another more subtle reference in the promotional flash game on Disney's website. 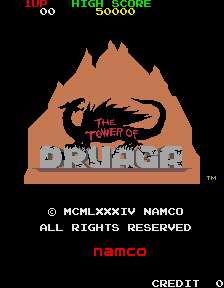 My keen famicom memory kicked in right away--this is the title music from Namco's Tower of Druaga! Have a listen to the Felix theme below first. Just something of mild interest for people curious about some of the movie's many video game references. I've seen some discussion online making other comparisons between music in the movie and other old games, though I didn't catch them personally. Gilgamesh should've shown up in the movie! I honestly can't stand the original Druaga, though I liked the roguelike PS2 installment "Nightmare of Druaga" a hell of a lot. Once the movie comes out on DVD/Bluray I'm sure there'll be a deluge of newly discovered in-jokes. Also, one of the high score-type themes is from Dig Dug. That's awesome. I'd like to hear it but couldn't find it on youtube...guess I should buckle down and work on getting a high enough score myself (haven't played more than a minute on it, to be honest).